Sinner or not, when one comes right up to Hawaii’s lava flows and peers into the abyss of surreal beauty and incredible power, one is duly humbled by Mother Nature’s machinations. The eerie scene gives the illusion of being present at the beginning of life on Earth. The awesome display of Mother Nature’s fireworks, or in this case, of Madame Pele, the Hawaiian volcano goddess, attracts thousands of visitors daily at Hawaii Volcanoes National Park on the Island of Hawaii (also known as the Big Island). Hawaii is one of the few places in the world where an erupting volcano can be viewed close up in relative safety. To see the activity, visitors drive to the end of Chain of Craters Road in the national park and hike to the eruption site, on the southeast coast of the Big Island. Here the creeping lava flows into the ocean, creating huge billowing steam clouds of volcanic smog, known as vog, over a stark landscape of raw new land. Hawaii’s Kilauea volcano began erupting on January 3, 1983, and has been in a steady active phase since then. According to volcanologists, this is the lengthiest eruption from the volcano’s down-slope rift zone in more than 600 years. Scientists at Hawaii Volcano Observatory note that the eruptive activity has slowed down recently, in comparison with earlier stages. Activity changes almost daily and is unpredictable at the Kilauea volcano, one of the most active in the world. The current activity began with cracks in the earth’s surface that created lava flows, which increased over time. 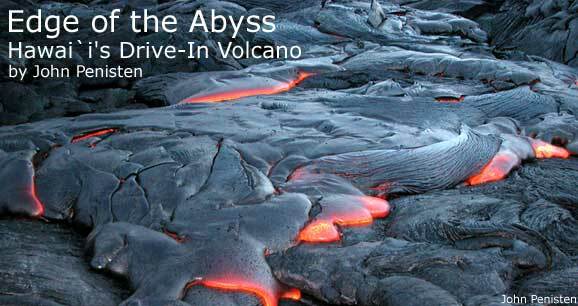 The lava ran several miles down slope in vast surface flows, at times reaching the sea through underground lava tubes. Since the eruption began, lava flows several feet deep have covered some 45 square miles (11655 hectares) of rain forest and desert. The eruption has also created more than 560 acres (226 hectares) of new land along Hawai`i’s southeast coast. The eruption has claimed no lives, but it has had a serious impact on area residents. 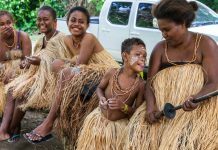 It has devastated the quiet seaside village of Kalapana and area subdivisions, wiping out more than 180 homes and other buildings, and disrupting many lives. 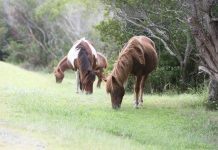 Flows have covered beach parks, several miles of roads and power lines, archaeological and historical sites, and a national park visitor’s center. It has also destroyed rare plant and animal habitats. In spite of all the destruction, the volcano is an amazing display. The 20-mile (32 km) drive down the Chain of Craters Road to the eruption site is visually stunning. The fern and ohia lehua forest (Hawaii’s most prolific native tree) open to vast stretches of lava flows reaching several miles down to the distant coastline. Roadside markers note the various eruptions, lava flows and still-steaming cinder cones bearing melodious Hawaiian names. The strong winds carry wisps of clouds down slope and out to sea as your car carefully winds down the steep pali (cliff). Along the route, marked trails across the lava fields lead to ancient Hawaiian petroglyphs, early rock etchings that record important events in the lives of people who held this land sacred. Rangers are stationed at the end of the Chain of Craters Road to inform visitors which areas are open and which are closed to the public. It’s a hike to get to the active lava flows. 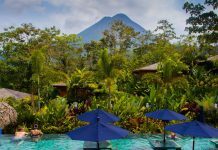 Depending on the volcano’s activity, this can be a short hike or a longer, more difficult hike of a couple of hours or more one way, over rough terrain. Looking up slope, one can see vast lava flows that have cleared wide swaths through the pristine Hawaiian forest on the way to the sea. Some visitors get as close as they can to the creeping tongues of lava. 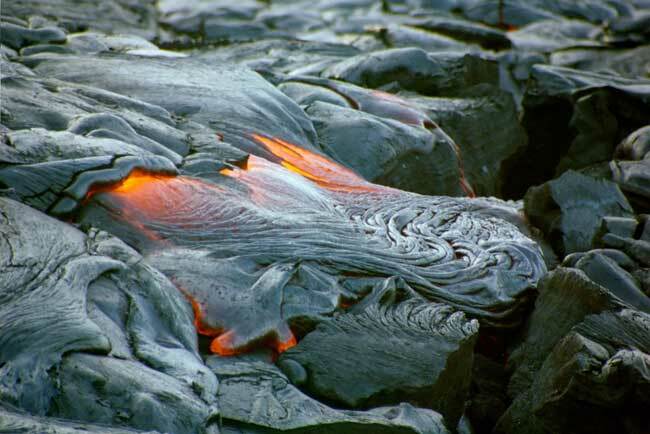 The smooth pahoehoe lava flows like fresh cake batter dumped from a bowl. Others stand on the edge of what used to be a lovely black sand beach, now covered by cooling, but still crackling and steaming, lava. Clouds of volcanic haze fill the air as the red-orange lava flows into the crashing surf. 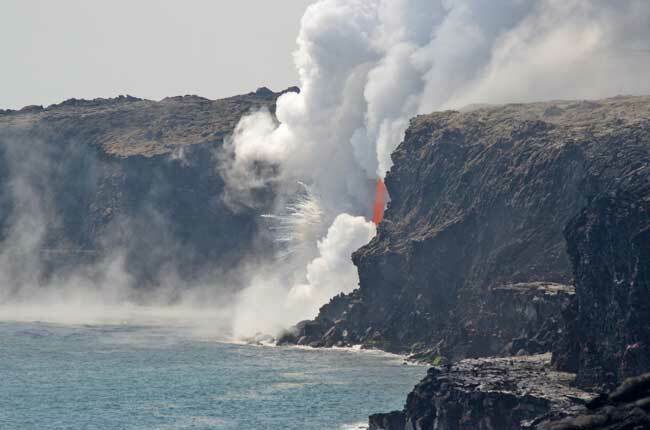 As the cool seawater hits the flow, the lava splatters and hisses, creating great vents of steam. Chunks of lava rock and pumice, still sizzling, break off and float into the water, to be carried by winds, tides and currents and deposited along the coast, to begin building yet another black sand beach. And so it goes, in an unending cycle. The volcano both creates and destroys. Visitors come away feeling fortunate to be among those who have seen one of Mother Nature’s most powerful and colorful spectacles. Nighttime is best for viewing the lava, but you need to be prepared, with good hiking shoes, hat, jacket, water, food and a flashlight. Check with park rangers on hiking hazards, stay on marked trails and obey all posted signs. 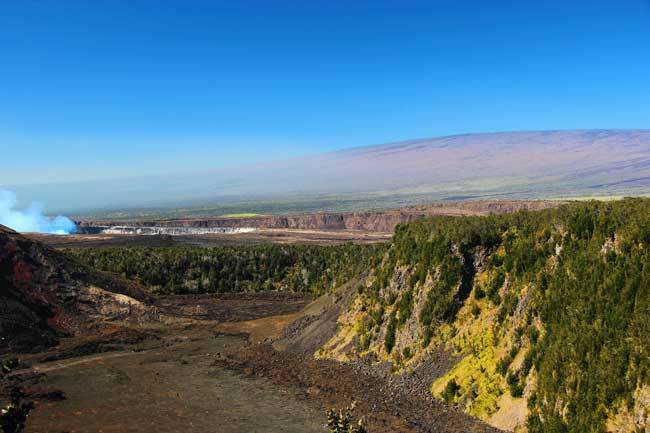 While visiting the national park, you may also enjoy Crater Rim Drive and Halemaumau Crater, Bird Park Trail and the Thurston Lava Tube. Be sure to be on the lookout for the endangered nene (Hawaiian goose), the state bird. For lodging at Hawaii Volcanoes National Park, check out the rustic Volcano House Hotel, www.volcanohousehotel.com. Backpackers can opt for simple A-frame cabins at Namakani Paio Campground in the national park; campground reservations are also made through Volcano House Hotel. Another good choice is the upscale bed & breakfast Kilauea Lodge, in nearby Volcano Village, www.KilaueaLodge.com.